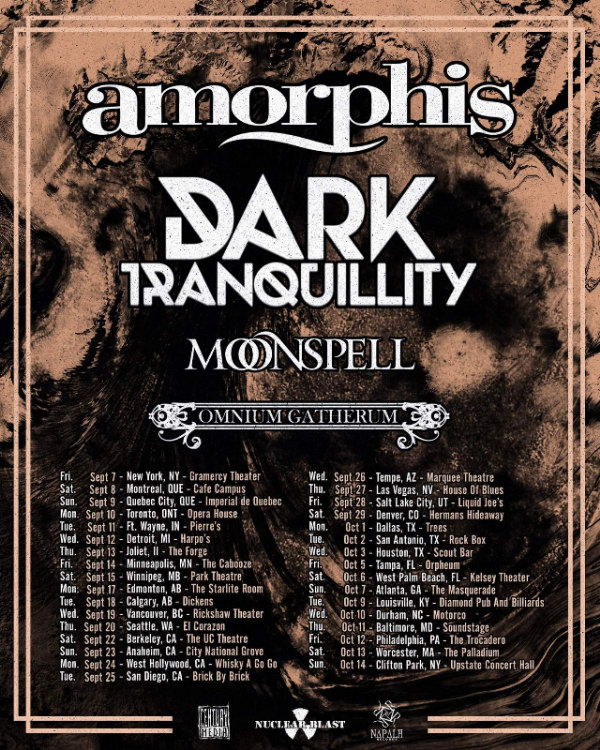 Sweden’s DARK TRANQUILLITY and Finland’s OMNIIUM GATHERUM will combine their melodic death metal forces as the CENTURY MEDIA RECORDS labelmates join Finnish heavy metallists Amorphis on their upcoming trek across North America later this fall. Also featuring support from Portugese gothic metal outfit Moonspell, the tour will run from September 7 to October 14. Full dates can be found listed at the bottom of this page.DARK TRANQUILLITY will be out in continued support of their eleventh studio album, 2016’s “Atoma”, which was nominated for a Swedish Grammi award. Check out the video for the album’s pulverizing single “Forward Momentum” here: https://www.youtube.com/watch?v=suhuQlYZwtE. “Atoma” can be streamed/downloaded at http://smarturl.it/AtomaiTunes. European fans can catch DARK TRANQUILLITY before they venture overseas on a headlining tour featuring support by Equilibrium from March 22 to May 5. Dates can be found at http://www.darktranquillity.com.OMNIUM GATHERUM are currently in the studio working on their next release via CENTURY MEDIA RECORDS due out later this year. Guitarist Markus Vanhala checked in from the studio commenting, “Greetings from the studio vaults, we’re busy here at forging the new OMNIUM GATHERUM album during the Finnish winter madness season, and the stars are aligned and the feelings & hopes are high here, even the outside temperature definitely isn’t! Everything’s been going really well and easily with producing this successor for the successful “Grey Heavens”, and i’ll promise this albums gonna beat the previous one for real – the league of angry old men are here for your enjoyment!Before we’ll announce any facts for the new album as title or release date, we can only suspiciously reveal that the album touring cycle will start this time from North America! Couldn’t hope to tour in any better company than this; joining together on a tour trek with our good friends of these three bands and the best acts of the scene – Amorphis, Dark Tranquillity and Moonspell. This tour will rule the stages and the roads, and be a metal party you and us won’t ever forget!”Take a listen to OMNIUM GATHERUM‘s “absolutely splendorous” and “awe-inspiring majesty” (Metal-Temple) single “Frontiers”, taken from their 2016 release, “Grey Heavens”, here: https://www.youtube.com/watch?v=ubmuUiozKyo.